One of my favorite things about my travels is sampling food and wine from different restaurants, I'm a #Foodie and a #Wine Lover and when Wine Tastings come to town it is one of my favorite things to do! But as we all know there are tastings and there are tastings right? 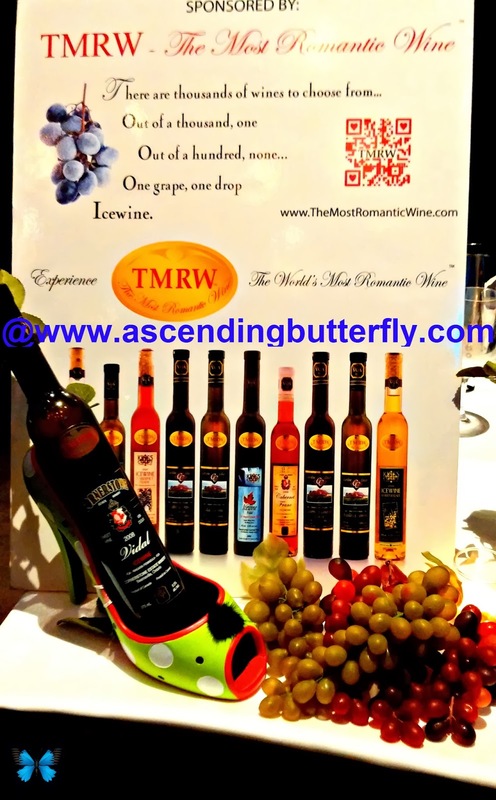 In February I had the opportunity to attend the NYC Winter Wine Festival at the Best Buy Theater in the heart of Times Square in Manhattan, New York City, and for Fall, the Festival returns to NYC this time at the beautiful Broad Street Ballroom in lower Manhattan, and Ascending Butterfly is stoked to partner with the NYC Autumn Wine Festival to be able to offer a lucky reader the chance to attend this amazing celebration of Wine Downtown! Alfred Gratien Brut Classique Champagne - This Cuvee Brut Classique from France while pricier than the Naveran Cava Brut mentioned above, had a great balance of aromatic strength and fresh exotic fruit. It's a blend of Chardonnay melding with fruity Pinot Meunier and Pinor Noir with a long-lasting 'mousse' (or what we call 'bubbles'). Barefoot Malbec - A plush red with flavors of blackberry and currant with a gust of vanilla, caramel and toasted oak. Barefoot Chardonnay - With honeyed peach and flavors of Fuji apple this medium weight with a hint of sweet vanilla aroma was a budget friendly winner! Barefoot Bubbly Brut Cuvee - With Green Apple, Jasmine, hints of kiwi and peach with aromas of Chardonnay this one was fun and fruity! Barefoot Bubbly Tropical Fusion - Fresh pineapple, island mango and papaya gave this one a burst of summer sweetness that you will definitely want to enjoy year round! Barefoot Refresh Crisp White - A perfect pair of Chenin Blanc and Riesling results in a vibrant yet light-bodied wine with notes of melon and pear and a fresh lemon-lime finish that can be enjoyed over ice! The Naked Grape Summer White Blend - They got it right when they describe this as sunshine in a bottle! The Naked Grape Moscato - A touch of fizz and aromas of peach and orange with a very clean finish! I am a big Moscato fan, and I do enjoy this one. The Naked Grape Pinot Grigio - A smooth red with black cherry and blueberry aromas that pairs with anything. TMRW - The Most Romantic Wine (event sponsor) - I have already featured them from previous tastings, but I can't stress enough just how much I love TMRW. There is no bad one in the bunch, I love ALL of them! If they ever opt for a non-celeb Ambassador I call dibs on being the first one! Jams by Kim (event sponsor) - These Artisanal Jams are all amazeballs and my standout favorite is the Savory Jam called 'Roasted Garlic and Sweet Onion Jam'. I incorporated this into so many recipes and honestly also enjoyed it straight on flatbread crackers as well! And the sweet Pepper Jam was a close second with sweet red peppers and Jalapenos. Buy more than one butterflies because I assure you it will be love at first bite! Cabot Cheese (event sponsor) - I got to hang with Cabot quite a few times this year at different events. Nothing pairs better with Wine than great Cheese! Cheeky Monkey Foods - Dipping Oil Nirvana is what I call these - they come in three flavors: Tomato Garlic Dipping Oil Regular: Sweet Garlicky Goodness, Politely Spicy and then Solidly Spicy which is Authentically Hot! I loved them all, but I am a total lightweight and have to admit, the regular was just right for me. I loved the rep I met and used this as more than a dip, I used mine to Marinate Meats as well and just like I advised you with Jams by Kim, buy more than one as you will run out way faster than you think you will! The Well Dressed Nut tempted us with their Pecans and Almonds as well! Sweet Silk Confections - Think handcrafted sweets with exotic ingredients! For me the hands down winner was pairing their Dark Cherry Cocoa Truffles with Red Wine! Take Things Personally - With a variety of unique Jewelry and Wine Charms the options are endless and they do take customized orders, making this an amazing hostess gift for those holiday parties you will be attending this season! There were a TON of amazing brands and wines, so we tried to feature some of the standouts above, but with over 200 wines it was hard to give everyone their own day in the sun here! With such a wide variety of brands and offerings I would call this is a Lifestyle Show! It's a wine tasting and so much more that's for sure! Here is a video from the Winter Wine Fest (I can be spotted 40 seconds in wearing my red Wallis Coat! Visit VIMEO to view it HERE! Ƹ̵̡Ӝ̵̨̄Ʒ - SPECIAL GIFT: As a special gift to you, every attendee will receive a FREE Riedel crystal stem from which to taste and to take home. A $10 VALUE. Ƹ̵̡Ӝ̵̨̄Ʒ - MUSIC: Special performance by Matt Marshak, Listen to his music. FTC Disclosure Info for this Giveaway: I was provided tickets to facilitate the review and giveaway. Sponsor is fulfilling directly to prize winner(s), this in no way influenced my opinion of the products. Once a winner is selected and their information has been forwarded to the sponsor, the responsibility of prize fulfillment, rests with the sponsor. All opinions are 100% my own. I am disclosing this in accordance with the Federal Trade Commission 16 CFR, Part 255 - Guides Concerning the use of endorsements and testimonials in advertising, you may visit our full giveaway and disclosure page for complete policy information. I don't see the date of the festival here anywhere, but I wonder if it's going to be during any of the weekends I will be down there? I will be down over Thanksgiving! @Masshole Mommy this is actually Saturday, November 22nd, the weekend before Thanksgiving actually! Worth looking into if you are going to come into town early! I'm not so wine savy but this is a great way to learn the nuts and bolts of wine .Getting to taste such a wide variety of wine in a fun and relaxed way sound amazing . This sounds like a great event to attend if you like wine. I am not a fan of wine, but I have a few friends who would love to go. A wine festival would be a great way to spend a day. I love to try all the local foods when i travel. We have been into Malbecs lately. It's nice to change up our wines every now and again. Our favorite part of traveling is usually the food! We have a list going of all of our favorite places to eat across the nation! This sounds like a fantastic festival - and a more excellent giveaway. My husband is a huge fan of Malbec and would love to try the various wines. That sounds like a great event. I would love something like this. Oh this sounds so great. I am unable to go but would love it. This sounds like an awesome festival! If I lived closer, I would love to go. Wow sounds like a great festival! I would check it out if I wasn't so far. Seems like something out of my zone so I would love to see! This would be so neat to attend. New York & wine sounds fun! I've never been to a wine festival before. Sounds like a lot of fun. I didn't start getting into wine a few years ago. On a whim we decided to buy a bottle at the store and pair it with some pasta. We were trying to have a fancy dinner in. We made a good choice. Next time we tried it with pie. It was ok. Then we tried it with grapes, apples, cheeses and dark chocolate. YUM. Since then we have attended some wine tasting events , pairings and try a new bottle every so often. It has been a lot of fun. Next week is the big Wine and Food Festival in Grand Rapids, MI. Its a 3 day event. We are hoping to go to one day but are aiming for all 3. That is the best way to develop your palate, tastings are a great way to expose yourself to wines that your local vendors may not even have! If you opt to cover the Wine and Food Festival Grand Rapids on your blog, let me know, I would love to read your coverage! Cabot Cheese is so so so good. It's kind of hard to find though! @mail4rosey - same for me, I have to go out of my way to find it, but it's always worth it! I love Cabot cheese paired with wine. You discovered such an amazing variety of wine-perfect with different pairings. Have you done pairings with chocolate yet? Definitely one of my favorite ways to go! I love wine, unfortunately I am allergic to some. The problem is, I don't know if I am allergic unless I try it. I've had the crisp white Barefoot Refresh and it's super tasty! I really, really liked it! That just sounds like too much fun. I love Cabot Cheese, too! This sounds like a really cool event. You can't lose with wine and chocolate!